Mayfly nymph of the pisciform genus Baetis (Baetidae). Photo by Jan Benda. Mayflies are one of the most basal, if not the most basal groups of winged insects alive today. The one thing that everyone knows about mayflies is that they only live for a day. This is reflected in their order name Ephemeroptera - "fleeting wing". But like so many other things that "everyone knows", this is complete twaddle. Mayflies do not live for a day. Indeed, by insect standards mayflies often have very long lives - many will live for an entire year, and some will live for as long as three years. The "fleeting" part of their lives is not their life as a whole, but only their time as adults. Like dragonflies, mayflies spend the juvenile part of their life cycles as aquatic nymphs. 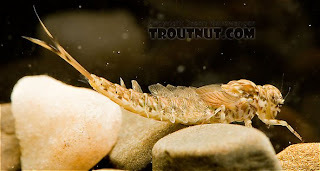 They are easily distinguished from the aquatic nymphs of other insect orders by their three long caudal filaments and the leaf-like lateral gills that run down each side of their abdomens. Most mayfly nymphs are herbivorous or detritivorous, but a few are predatory. In contrast, adult mayflies have almost non-existent mouthparts, and do not feed - hence their "brief" lives. 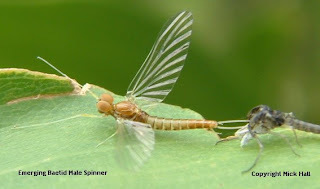 Mayflies are also unique in being the only living winged insects to undergo a moult after their wings develop. They first emerge from the water in a form known as the subimago, which soon moults into the final, fully mature imago. Mating usually happens in the imago stage, but there are some species that find themselves unable to wait that long, and begin mating as subimagoes (Grimaldi & Engel, 2005). Siphlonurus quebecensis (Siphlonuridae), another pisciform nymph. Photo from Troutnut.com. The contrast between mayflies' long juvenile lives and brief adult lives highlights a common prejudice to which almost all of us are prone - we tend to think of most animals in terms of their adult forms rather than their juvenile ones. There are a number of reasons for this. One is that we ourselves spend more of our life cycle (if we're lucky) as adults than juveniles. Another is that the adults are usually larger and more visible than the often reclusive juveniles, so we're more likely to notice them. Even working biologists may be prone to this trap - many animals can only be fully identified once they reach adulthood, which leads to the subconcious tendency to dismiss the unidentifiable juveniles as unimportant. But from an ecological perspective, it is the long-term juvenile mayflies that are far more significant than the brief adults. Adulthood in mayflies is simply a coda, a brief interlude to prepare for the next movement. Similarly, one could argue about how appropriate it is to characterise mayflies as flying insects when for so much of their lives they are not, with flight for them having no other purpose than to facilitate the reproductive process. More Baetis nymphs. Photo by Surly Ghillie. An influential classification of recent mayflies by McCafferty (1991) divided them into three suborders, Rectracheata, Setisura and Pisciforma, largely on the basis of their tracheal anatomy. 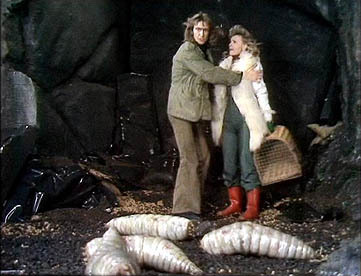 Unfortunately, McCafferty did not explicitly refer to the characters on which he based the Pisciforma, other than noting that the name referred to the "minnow-like bodies and actions of the larvae". McCafferty (1991) regarded the Pisciforma and Setisura as forming a clade to the exclusion of the Rectracheata. In contrast, Kluge (2004) used an alternative classification* that more or less united McCafferty's Setisura and Rectracheata into a clade Bidentisetata, with two tooth-like setae on the maxilla (I say more or less because the families involved were not exactly the same), separate from the "Tridentisetata" (effectively McCafferty's original Pisciforma) with three tooth-like setae. Kluge explicitly stated, however, that his Tridentisetata was a taxon of convenience united by plesiomorphies only and probably paraphyletic with regard to the Bidentisetata. Recent molecular analyses have confirmed that the "Pisciforma" are paraphyletic or polyphyletic. Ogden & Whiting (2005) found both Rectracheata and Setisura nested within Pisciforma, and suggested that the fish-like nymphal form was plesiomorphic for all living mayflies and lost on numerous subsequent occasions. *Very alternative, in fact. Kluge (2004) introduced a new system of nomenclature that attempts to provide an alternative to the rank-based system. Without wanting to go into too many details (for a start, that would require me to actually follow what's going on there, and frankly I haven't got a clue), Kluge's system involves a combination of a type genus plus a suffix indicating a taxon's position in the taxonomic hierarchy. So Arthropoda, for instance, is referred to by Kluge as Araneus/fg7. Seriously. A male baetid moulting into an imago. One of the easiest differences to spot between the submature subimagoes and the fully mature imagoes is that in the subimagoes the wings are generally opaque, while the imagoes have transparent wings. Photo stolen from Mick Hall. There is one little detail that I have to mention before ending this post. One characteristic of the wings of living mayflies as a whole is a significant difference in size between the fore- and hindwings, with the forewings significantly larger. This is taken to its extreme in one of the pisciform families, the Baetidae, which are one of the few groups of insects in which the hindwings have been almost entirely lost, reduced to small pair of buds like those of flies. McCafferty, W. P. 1991. Toward a phylogenetic classification of the Ephemeroptera (Insecta): a commentary on systematics. Annals of the Entomological Society of America 84 (4): 343-360. Ogden, T. H., & M. F. Whiting. 2005. Phylogeny of Ephemeroptera (mayXies) based on molecular evidence. Molecular Phylogenetics and Evolution 37: 625-643. Along the lines of excessive focus on the adult stages, one of my own great personal realizations was that of necessity, the life cycles of everything extend throughout the year. Hence, they can be collected throughout the year, including in winter. Granted, some stages are difficult to collect because they are minute. Non-arthropod students might not realize that consequence of the different morphology of the different life stages is that keys are developed for each stage of the holometabolus life cycle. There are even egg keys in some groups, not to mention larval, and pupal keys. And of course nymphs and naiads. I never did like the clout that McCafferty holds in the study of Ephemeroptera, or aquatic insect study in general. He seems to just insert and change names on a whim with no care for the people actually working in the field and no regard for actual strong evidence in support. At least its mostly agreed that the Odonata and Ephemeroptera are sister groups, but everything below the order level identification of Ephemeroptera, a well supported monophyletic grouping, is in a state of flux. I also agree with Mike Huben above. 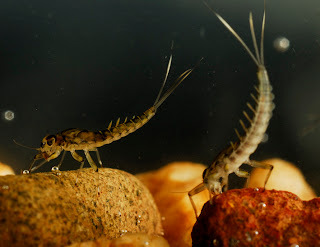 In insect taxonomy, aquatic insects especially, the life cycle at all life stages is closely considered, as the immatures are far more economically important than the adults, and often used to develop indices of water quality. There are even egg keys in some groups, not to mention larval, and pupal keys.It depends on the group, of course. In phasmids, for instance, many species have more diagnostic eggs than adults. Kai, I found very little phylogenetic studies for Ephemeroptera (at least at supra-familial levels), and most of those were based on intuitive rather than algorithmic methods. I must say, though, I've seen far more studies recently supporting mayflies as sister to an Odonata + Neoptera clade than supporting an Odonata + Ephemeroptera clade. Most of the characters that have been regarded as supporting the latter (such as short antennae with aristae) are either of doubtful homology, or are absent in the stem groups of one or the other. 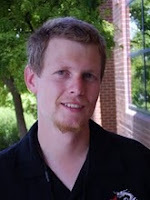 @C Taylor: Yes, I've heard that too, that Ephemeroptera is the most basal branching of the Insecta clade, and that Odonata plus Neoptera are the other branch (it looks more like a polytomy in the former case anyway). I stand corrected. Thats not even adressing the Neoptera itself, and all the ordinal relationships within (Cf. Blattodea and Isoptera, Psocoptera and Pthiraptera, The placement of Strepsiptera, and arrangement of Mecoptera, Siphonaptera and Diptera). In other words, its all a mess; we need more insect systematists! Is one of that dying breed of scientist.